Lately I have been busy trying to help my family really understand how to live a healthy lifestyle. I realized it is not only about exercise or eating food that seems “healthy”. It is also about understanding what are the right foods to eat and to control things like the amount of sugar being consumed. We have a history of diabetes in our family so it is especially important. I really did get “Fed Up” with the type of foods in the schools, restaurants and even grocery stores that have moved so far away from whole food ingredients. We just recently started cooking from scratch, adding more plant foods and even making my kid’s lunches for school. I am also trying new nutritional apps and websites that I am excited to talk more about in future posts. 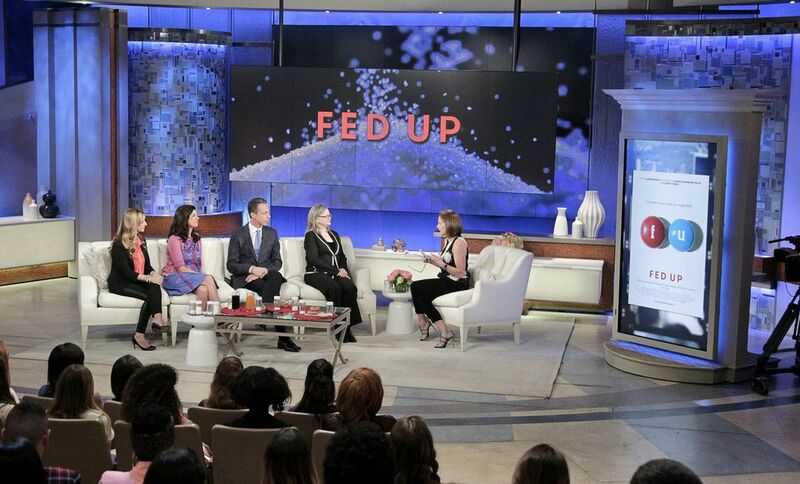 But for today, I am excited that Katie Couric took her amazing background in investigative journalism and worked with Laurie David (Oscar winning producer of AN INCONVENIENT TRUTH) and director Stephanie Soechtig, to create a documentary on the truth behind the obesity crisis in America called Fed Up opening in Theatres across the country today (May 9). This was the topic of the Katie Couric Show on May 8 as well. I wanted to share some of this information to help spread the word in the hopes that everyone will take the time to learn more about this important topic. Photo Credit: Credit: Disney/ABC. Katie Couric Show #2148 with Stephanie Soechtig, Laurie David, Dr. Mark Hyman and Dr. Margo Wootan.